What media do they like / watch? How often do they login? What kind of info do they post? While you’re trying to build up your audience, first consider traffic to the major social networks so you can get the biggest bang for your buck. Facebook, YouTube, LinkedIn, Twitter and Pinterest are the top 5 in the US if you were not sure. 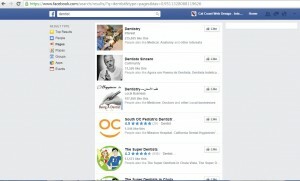 TIP: Connect your email database with your Facebook page. Did you know you can create a custom audience on Facebook with your Mailchimp email database. Don’t have an email database? 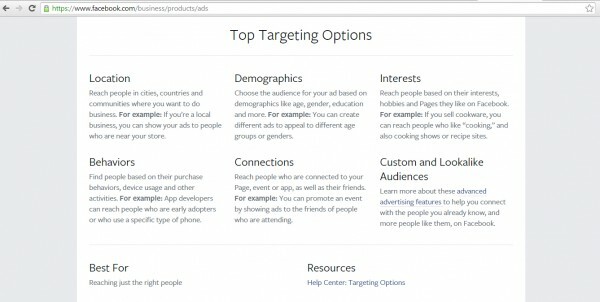 Well, you can even install a custom Facebook “cookie” on your website that targets the visitors who have been to your site to like you on Facebook. Ever wonder how the ads seem SO spooky relevant in your account? The HTML code to do this is simple and can be installed just like Google Analytics. Call us at 888-281-7665 x2 if this is too techie and you’d like help with implementation! Now let’s try the same ‘dentist’ search on LinkedIn. You can search for your target by keywords. Or groups. Or posts. Or people. Or companies / universities. Sometimes you’ll find way more of your target on LinkedIn than on Facebook…you just never know until you try. Join the relevant groups and start interacting. View profiles and send connections. Ask for introductions and keep on connecting! Ready to try Twitter Ads? Click Twitter Ads in your profile, and then Add Campaign. Here’s a full tutorial from Twitter itself. You can target specific interests, followers, or twitter user accounts. Browse and select interests so you can really whittle down to your exact target. Twitter also has website card that can connect your tweeps with your website better – just ask your webmaster (or us!) to try it out. Building up your Twitter audience can help you get so much influence – we highly recommend you put a strategy in place if you haven’t yet! Grow your Pinterest by searching pins, or pinners, or specific interest boards. Don’t forget to search for the locations and hobbies your target market has, too. Unfortunately Pinterest does not have ads right now, however you can still search to find your ideal market and easily connect with them. To Recap, we just gave you a ton of homework on how to build out your social sphere! Once you find your target….engage with them 🙂 Follow, friend, connect, comment, retweet & repin. Show some interest in your new niche connections BEFORE YOU ASK FOR FAVORS OR BUSINESS. Here’s a quick list of ways to enhance the process. Wait…..what’s this going to COST???! The cool part about social advertising is YOU determine your budget. Neal recommends to start with a budget of about $10-20/day for your ads, and adjust as necessary from there. Cal Coast highly recommends you consult with an Internet Marketing Specialist before you launch your campaigns. Even if it is a small amount of money, paid advertising is still like being the new guy at the poker table…your money will continue to get taken until you figure out the formula. We can help you get there quicker, so call us today at 888-281-7665 x2 or tweet @CalCoast for an appointment. Angie Weeks is the founder and CFO of Cal Coast Web Design and has over 15 yrs experience in the SEO marketing industry. As an active member of Cal Coast Web Design’s research and development team, sales force and accounting department, Angie transforms our clients’ needs into a dynamic SEO program that helps incorporate and systemize their business and works with clients on a daily basis to ensure their SEO programs are always meeting their unique needs. Angie attended Macomb College as a graphic design major in her home state of Michigan, and moved to California to continue her education at Saddleback College and Cal State Fullerton. She started her SEO career with Advanced Access in 1999, and found a unique Virtual Assistant niche. When Angie is not working at Cal Coast Web Design or in her real estate business, she enjoys making a difference in the community and volunteers her time with Saddleback Church and Habitat for Humanity, while hooping for time to relax and paint.